Are you suffering from a Whiplash Injury in Calgary? Then National Spine Care has the solution for your Calgary Whiplash Injury. Whether you have just been injured in a motor vehicle accident or have been suffering from persistent pain from an accident a long time ago, here are some secrets you should know. 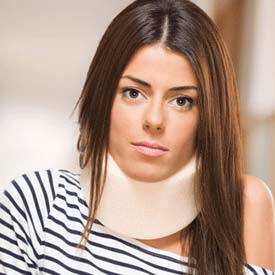 At National Spine Care, we help a lot of people that injured their neck in a car accident. The more you know about what is wrong and what can be done to fix it, the faster you’ll recover. Here are some things you need to know about whiplash injuries. This type of injury is most commonly associated in North America with Motor Vehicle Collisions. For example, you might hear someone say “he got whiplash when his car was rear-ended by another car”. The term Whiplash can be confusing to most people because it is often used interchangeably to describe both a mechanism of injury and the injury itself. For our purposes, the term Whiplash Injury will be used to describe how the injury occurs (a mechanism of injury). The head is sitting on top of the neck, much like a ball on a stick. When an unexpected, jarring movement occurs, such as when you are hit from behind by another car, the weight of the head causes the neck to snap backwards and forwards. This extreme movement is similar to the lash of a whip and can result in damage to the bones and soft tissues of the neck, which can be quite painful. Although most often associated with motor vehicle collisions, this type of movement and injury can occur in work injuries or sports injuries. It is important to know what a whiplash injury is but if you have neck pain or heads due to a car accident, it is probably more important to know what to do about it. There are a few things you can do that, if done properly, will speed your recovery and minimize the chances of your injuries going on to cause persistent problems. Reassurance: First and foremost, if you have suffered a whiplash injury because of something like a car accident or sports injury, it is important not to worry. The health care community has spent considerable time and effort studying this problem and understands it quite well. This research has shown that the vast majority of whiplash injuries, while quite painful and debilitating in the early stages, are not serious. Our bodies have an amazing ability to heal themselves, so given the appropriate management and treatment, the vast majority of these injuries recover fully and you are able to get back to all of your normal activities. When I say don’t worry, it does not mean you should ignore or minimize your injury. Quite the opposite, it is important, no matter how minor you may think your injury is that you be evaluated by a properly trained health professional such as a chiropractor, physiotherapist or medical doctor. Get checked: It is very important you be checked as soon as possible after your injury. The research is quite clear that the earlier in the injury process you can be evaluated and started on appropriate management or treatment, the better the outcome. One of the biggest mistakes we consistently see is people ignoring their problem for a week or two after the injury, hoping the pain will go away on its own. We find that the longer people wait to seek attention, the harder it is to help them get out of pain and get going again. National Spine Care and Sports Medicine is located in Calgary, Alberta and If you have been injured in a car accident, this province’s insurance industry has changed its processes to encourage you to get in early to be evaluated. In order to claim any treatment costs under your car insurance benefits, they generally need you to be checked by a chiropractor, physiotherapist or a medical doctor within 10 days of the injury. If you are past the 10 day guideline, don’t worry, often insurance companies will still approve any treatment recommended by your health provider. Key Point: Get Checked to make sure! Earlier assessment and appropriate treatment means faster recovery! If you experience any of this, you require immediate medical attention. Ice. Cooling the area with ice reduces the pain and inflammation. A good rule of thumb is to lay down with an ice pack on the back of your neck, extending from your head down to between your shoulder blades. You should have the ice on for 15 minutes and repeat this process every two to three hours. I have found the Gel packs you can keep in your freezer most effective for this, because they are mouldable to your neck and will stay cold long enough to be effective. Make sure you have a towel or cloth between the ice pack and your skin so you don’t frostbite the skin. Rest. In the early stages, it is helpful to unload the injured and painful structures. This means laying down to get the weight off your neck. Your head weighs at least 10 pounds so gravity will strain your neck if it has to work to hold up your head. Sitting won’t rest your neck. You need to lay down. As mentioned in point #1, combining the rest with icing is most effective. Medication. You need to be careful taking any kind of medication because of potential negative side effects. Either you doctor or a pharmacist is a good resource to ask about what kind of medication may be helpful. Over-the-counter NSAID’s (Non-Steroidal Anti-inflammatories) such as Advil, Motrin (which contain an anti-inflammatory ingredient called Ibuprofen) or Tylenol (which contains a pain relieving ingredient called acetaminophen), can help with pain and inflammation control. Stronger medication requires a prescription from your doctor. Soft collars. We don’t usually recommend the use of soft collars anymore because research has shown that prolonged immobilization of the neck can lead to chronic problems. For more severe injuries, a soft collar may be permitted for the first 72 hours to help offload the painful structures. You need to discuss this with either your chiropractor, physiotherapist or medical doctor prior to wearing one. Modern treatments rarely use collars on a prolonged basis. Self-help advice and instruction. Your health care provider can customize pain management strategies as well as activity modification advice so you can do things yourself to help you recover quickly. Hands-on treatment may be required to reduce pain and restore mobility. Active rehabilitation. This includes resuming your normal activities as well as specific stretching and strengthening exercises you may need to rebuild the flexibility and strength of the injured area. Phase 3 of healing involves remodelling of the tissue. Once the damaged tissue has been repaired, the body continues to reorganize it to better deal with the stresses and strains the injured area needs to cope with. This generally begins 8 to 12 weeks after the original injury and can go on for months or even years. Whether or not you have had appropriate treatment, you may continue to experience neck pain, back pain or headaches months after your original whiplash injury. This may be normal as your body continues to heal, however there are a few things you should watch for to know if you may benefit from more advanced treatment options. Depending on the severity of the injury, the damaged tissues can take 8 – 12 weeks to fully repair. This doesn’t mean that your neck isn’t hurting anymore, however. Research has shown that 59% of Whiplash Associated Disorder (WAD) injuries remain symptomatic 6 months after the injury. 25 – 40% continue to experience pain up to 2 years and approximately 10% go on to experience pain and symptoms for the rest of their life. So what, if anything, should you do if you are still experiencing neck pain, headaches or other symptoms 3 months after the original whiplash injury? Normal recovery: The first approach is to determine if the symptoms you are experiencing are normal considering the nature and extent of the injury you had. Consultation with your health care provider should help you sort this out. Should this be the case, then you may just need more time to finish recovering. The emphasis of any treatment you may still be receiving should be on active rehabilitation (i.e. exercise and resuming your normal activities). You may still need some hands-on treatment for pain control. This type of treatment is referred to as passive care, and includes things such as joint manipulation, soft tissue treatments such as massage, and trigger point injections. This type of treatment should be minimized at this stage. If you find you are still dependent on going for this type of treatment two or three times per week, then it may be time to seek another opinion to ensure there isn’t anything missing from your care. Facet joints: The general consensus in the literature is that the most likely culprit for causing ongoing neck pain following whiplash injuries are the facet (“Fah – set”) joints. These are tiny joints located in the back part of each vertebrae that connect one vertebrae to the other. These joints are damaged from the extreme movements that happen during a whiplash injury. While the ligaments that hold the joints together may repair themselves, there is some evidence that injury to the cartilage that lines the joint surfaces, or even the bone surfaces just underneath the cartilage could have been injured and are the source for ongoing pain. In situations like this, treatments such as facet joint injections or even ablations may be considered to help relieve your pain. These treatments are obviously more invasive and should therefore only be considered if your condition hasn’t responded to the normal treatments such as chiropractic, physiotherapy, massage therapy and active rehabilitation. Muscles: Chronic shortening of the muscles can be another cause of ongoing pain. These tight, short muscles may also have developed trigger points in them. Trigger points are local, painful areas within the muscle which also can refer pain to other parts of the body such as the head, jaw or shoulders. Effective treatments for chronically shortened muscles include Massage Therapy, Intramuscular Stimulation or IMS or trigger point injections. Remember, however that these are passive treatments, meaning the treatment is done to you. You don’t have to do anything active, which we know on their own, won’t give you long term relief. The key is to work with your health care provider to use treatments such as these judiciously to relieve your pain enough so that you are able to actively stretch and rebuild the strength of the injured area. Common sense tells us that it is much easier to do appropriate activity and exercise if the area isn’t painful. Active rehabilitation: One of the most common, but often overlooked causes of recurring trigger points in the muscles causing ongoing neck pain is weakness. It is a catch-22 because the pain has caused your body not to use the neck muscles properly. Because the body is “use it or lose it”, weakness or disuse atrophy occurs. Most active exercise regimes involve strengthening of the upper body and shoulders but may overlook the neck itself. The structures in the neck are somewhat delicate, requiring a specific, targeted rehabilitation program in order to regain their function. A very successful active rehabilitation program that was pioneered in Melbourne Australia uses sophisticated computer-based technology to measure whether your neck is weak and then acts like a gym workout for your neck. Their research has shown that this supervised; strengthening program using the multi-cervical unit (MCU) offers significant relief for chronic neck pain. Take home message: Normally, following a whiplash injury, the damaged tissues have repaired themselves within 8 – 12 weeks of the injury. If you continue to experience neck pain, headaches or other symptoms beyond the 3 month point, it may be part of the normal recovery time depending on the nature and extent of your injury. The focus of the treatment in this case should be on active rehabilitation rather than being dependent on passive treatments. In a smaller percentage of the cases, however, ongoing pain and symptoms could indicate that your problem requires more advanced treatment. book your Calgary Whiplash Injury consultation appointment today!